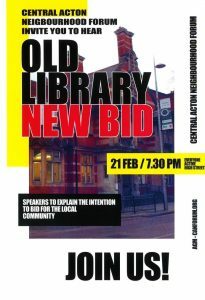 Bidding has reopened for parties interested in taking over one of Acton’s most prominent buildings, the old Acton Library. Ealing Council had agreed a deal with Curzon Cinemas to take over the vacant library building and convert it as a cinema, restaurant, bar and three flats. But the deal has broken down and the library remains empty and unmaintained. So the Central Acton Neighbourhood Forum (CANForum) are dusting down some 2014 ideas to take over this cherished listed building and use it as a hub for the local community, including a small cinema, theatre space, coffee bar and workshop space. These proposals originated when the Council first announced it wanted to dispose of the building. Initially, both the Council and Curzon Cinemas seemed interested in a combined approach but they soon lost interest leaving those who had worked on it feeling they had been misled. The Library building has a tremendous local significance. It was gifted to the community by the Victorian philanthropist Passmore Edwards. Edwards was internationally renowned as a champion of the working classes. Another of Edwards’s gifts was Shepherds Bush Library which has now been transformed into the Bush Theatre . It is a fine example of what can be achieved. What are the chances of things working out in Acton this time round? As a test of support, CANForum is holding a public meeting at the Everyone Active Centre on February 21st, starting at 7.30. Its time to start cherish our heritage and keep them for generations unborn. Selling them off and subsequently converting them for commercial businesses surely is not only reckless but criminal. We must resist the sale or conversion at all cost. The Acton Library is the only listed building in Acton. It must be preserved in its glory for the new generations to behold. Yes commercial its use to expand & enhance the social life of the local residents but it’s integrity must be preserved at all cost. Can you let people know the update on this? What happened at the meeting and when is the next one?